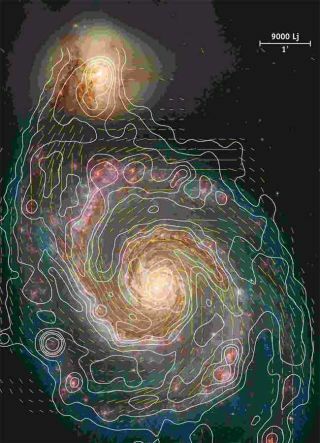 Image of the spiral galaxy M51 overlaid with contours of the total radio intensity. The small vector lines represent the direction of the magnetic field at each point. Galaxies much like ours harbor mysterious magnetic fields,which turn out to build up much faster than scientists realized, a new study hasfound. By analyzing light coming from distant galaxies at a timeearly in the universe's history, astronomers were able to show that thesegalaxies developed magnetic fields much sooner than expected. The finding may force scientiststo rethink their understanding of how magnetic fields grow inside galaxies. "The magnetic fields in these galaxies were verystrong, at least as strong as they are today, at a time when the age of theuniverse was only one third of its current age," said researcher FrancescoMiniati of the Swiss Federal Institute of Technology. "That puts strong constraintson the evolution of magnetic fields." The discovery was made with the help of faraway lightsources that served to illuminate the galaxies being studied. Miniati and his colleagues used the European Southern Observatory?sParanal Observatory to observe the very distant bright objects, called quasars,in both visual and radio frequency light. Quasars are the central regions of somegalaxies where supermassive black holes generate tremendous emissions across theelectromagneticspectrum, from radio waves to visible light and x-rays. The radio waves the researchers observed often showed signsof having passed through a magnetic field. It turned out, when a normal galaxylay between Earth and the quasar, the magneticfield signature on the light was most strong. This told the researchersthat it was the foreground galaxies, and not the quasars, that held theresponsible magnetic fields. "We were surprised that we could actually measure thisso cleanly, and we were surprised that these galaxies had such strong magneticfields early on," Miniati told SPACE.com. "This has beensuggested before, but seen convincingly only for some individual galaxies. Whatwe were able to show with this measurement is that all regular galaxies earlyon have these kinds of strong magnetic fields." Scientists think galactic magnetic fields start from tinymagnetic seeds, perhaps created inside stars or quasars, and are then amplifiedover time as the turbulent movement of galactic gas, stirred up by stellarexplosions, and the galaxy's rotation cause the magnetic fields to grow. Thisstandard picture, however, can only account for strongmagnetic fields that build up slowly over time. The new finding meansscientists must come up with an improved explanation for how magnetic fieldsbuild up inside galaxies in the young universe such as those Miniati and histeam observed. The researchers detailed their discovery in the July 17issue of the journal Nature. The study was funded by the Swiss NationalScience Foundation, the Natural Sciences and Engineering Council of Canada andthe U.S. Department of Energy.